One new exhibition at the Daura Gallery invites users to see red in a new light. Titled “red,” the show explores fascinating ways that artists use the color to direct attention, as well as the science and symbolism of the color. 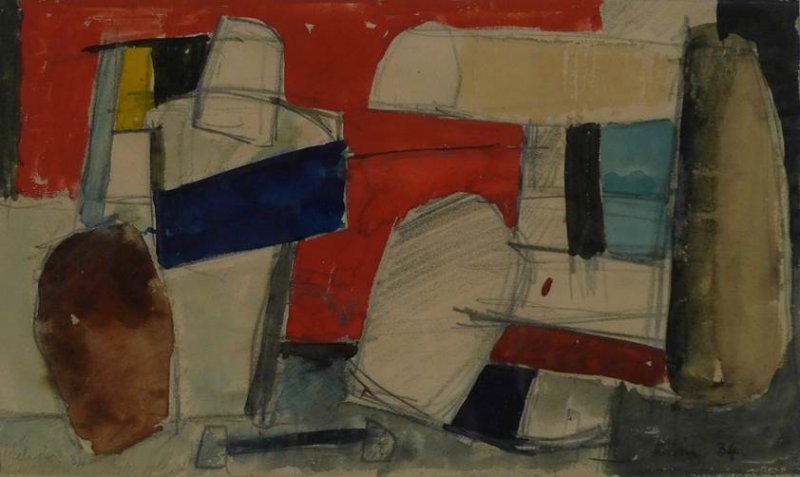 Jean Hélion, Untitled, mixed media, 1942. Collection of the Daura Gallery. “Red” features works on paper from the 20th Century, including art from the Daura Gallery collection and art on loan from other museums and colleges. The works include pop art, expressionism, dada, and surrealism. The exhibition also displays academic essays about the color red from the standpoint of physics, biology, psychology, and political science. Dr. Julius Sigler ’62, Dr. Nancy Cowden, Dr. Virginia Cylke, and Dr. Daniel Lang wrote the short essays specifically for the exhibition. Two other exhibitions are on view this semester. “Primitives” is a collection of poems and woodcuts by Max Weber, one of the first American cubist painters. Born in the Russian-Polish city of Bialystock, he immigrated to the U.S. with his parents when he was 10. He taught in the public schools in Lynchburg before moving back to Europe and studying art. When he returned to the U.S., he helped introduce the country to avant-garde art movements such as fauvism and cubism. A third exhibition includes 30 figure study drawings. Corresponding with Dr. Beverly Rhoads’ figure drawing class this semester, the exhibition allows viewers to see how figure studies serve as an essential exploration by artists embracing any style. All three exhibitions will open in a reception on Monday, January 18, at 4 p.m. in the Daura Gallery. The works of Max Weber and the figure studies will be on view until April 8, and “red” will show until May 5. The Daura Gallery is open Monday – Friday from 10 a.m. – 3 p.m., or by appointment. Admission to the Daura Gallery and its programs is free.